Keep it simple and get yourself the next clear cut hot-hatch legend. VW is on track with the latest Golf performance package known as the Volkswagen Golf R. A large leap forward in maximum power makes sure the Golf R is right ready for any high speed action. With the release of Honda’s quick Type R, and Renault’s mad RS Megane the gap has closed on the Golf GTi, but has Volkswagen still offers more with the 2017 Golf R.
A close look at the latest Golf performance edition has the Golf R looking very subtle in its performance design cues. Parked next to a Honda Type R or RS Megane, the VW Golf R appears rather unadventurous. Even compared with the super quick Mercedes A45 AMG and Audi RS Q3, the Golf still looks extremely conservative on its performance flair, however there is always a bit of fun pulling away from an “in your face” HSV or Nissan 370 Z at the lights in what seems like just a great looking hatchback. This is not to say that the Golf R lines are not nice to look at, however. 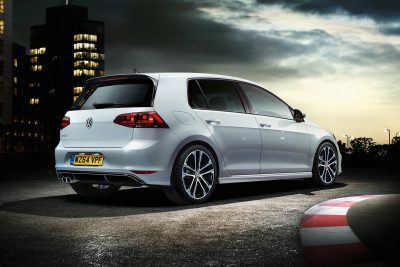 The Golf R power is hidden behind an elegant hatchback design that sits low to the ground and slips neatly through the air. 2017 sees some nice design upgrades that include a new front bumper, lower air intake and guard panels, plus a new bumper and diffuser at the rear of the car. Premium LED lights with dynamic indicators are also featured front and back, while a striking set of 19-inch Spielberg alloy wheels capture attention. Handling a lot of feisty engine power can lead to the acquiring of AWD for maximum traction and power delivery – especially through the corners. Where the Golf R differs from Honda’s Type R, Renault’s Megane RS and even the quick little Golf GTi is the addition of AWD into the performance equation. The other cars are driven via the front wheels and, though very tidy performers, they can’t quite keep up with the Golf R’s ability through the corners and when conditions get more than just a little slippery. The new Golf R hot hatch adds all-wheel-drive traction and a tuning upgrade over the Golf GTi performance package. Boasting the upgraded 2.0-litre turbo-charged engine, the Golf R driver now enjoys power well over 200 kW married to lusty torque that flows at 380 Nm from a low 1850 rpm. Engine dynamics are pure thrills with 213 kW of power available at 5400 rpm. With this type of engine power and AWD available exclusively to the Golf R, performance stats equal those you’d find in the A45 AMG and Audi RS Q3 rides. Expect the VW Golf R to run the 0-100 dash in 5.2 seconds with the 6-speed manual gearbox. A quicker 4.8 seconds results from VW’s inclusion of the lightening quick DSG gearbox – which is the other gearbox offered to buyers of a new Golf R. These are seriously quick stats, and the car has been limited to a top speed of 250 km/h. With superb performance like this available on tap, the 4MOTION all-wheel drive system is there to keep you glued well and truly to the road. The Golf R also comes with huge ventilated disc brakes all-round (another 2017 upgrade) that are connected to the latest ABS technology for premium stopping power. As you can imagine this is a seriously enjoyable car for all occasions. Inside the new Golf R there is sleek black Vienna-leather appointed seats as standard. The driver of a new VW Golf R has the addition of a heated, electrically adjustable driver’s seat with memory function for premium comfort. You’re very comfortable in the sport bolstered front seats, and room inside the Golf interior is typically excellent – and you can even carry plenty of luggage with you to keep this a practical little performer. A good hot hatchback remains pretty hands-on versatile in the real world – making them a highly sort after performance buy. Even with the back of the rear seat up, the new VW Golf R has 343 litres of luggage space – and it’s nice and deep to accommodate tall items. Rear seat folding is standard. 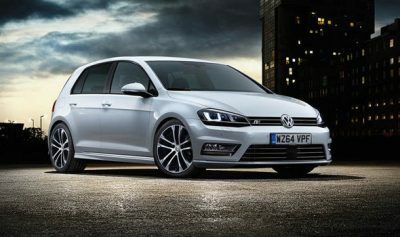 The Golf R has a nice interior that has been carefully constructed to feel relaxed and comfortable, while premium materials are used to look good and last the test of time. A fully-digital active information display screen graces the driver’s console and is 12.3-inches across. In the centre of the dash is a new-generation 9.2-inch infotainment touch screen that boasts all the latest features like App-Connect2, modern gesture control and voice control. A range of displays for navigation, infotainment, driver assistance and vehicle performance functions are available, while the built-in navigation displays 2D and 3D (bird’s eye) maps. So up-to-date, the 2017 VW Golf R comes equipped with the ability to link with your smartphone’s screen and relay this onto the car’s display. Features like selected apps, maps and music via Apple CarPlay, Android Auto and MirrorLink interfaces provide loads of entertainment for any long journey. These modern technologies will also be a real winner with the rest of the occupants. Safety features include Driver Fatigue detection 3, seven airbags, active cruise control and Auto Hold. Five-star safety is a standard feature of the new Golf R that you’ll be pleased it has. Far from being potently fast, the Golf R ensures all measures have been taken to help prevent you from accidents occurring in the first place. However, if the worst occurs, the Golf R is very solidly equipped with the best active and passive safety features designed to protect in the event of a crash. A special alarm system with an engine immobilizer is also part of the Golf R’s extensive item list. You’ll need this, as this is a very desirable drive. Enjoy! For any more information on the latest Volkswagen Golf R or, for that matter, any other new car, contact one of our friendly consultants on 1300 303 181. If you’d like some fleet discount pricing (yes even for private buyers! ), we can submit vehicle quote requests out to our national network of VW dealers and come back with pricing within 24 hours. Private Fleet – car buying made easy!